I think she looks really good. Overalls are so hard to do (the failure rate is alarmingly high), but she pulls it off. Great look! Love her hair and this wonderfully ecclectic style….simply gorgeous! Wow, never thought I’d say this about a look with these elements (overalls — WTF?) but she looks fantastic. And your posts today have convinced me to give shoe booties a try. Thanks! It IS fun! It’s hip, young and carefree. Certainly nothing to be ashamed of wearing out in the streets in the middle of the day. Good to see she is taking no precautions, yet flawlessly projects fun fashion using an unthinkable combination. Again I have fallen in love with one of your subjects! What a radiant personality – her lovely face and smile make the clothes shine. I especially like the shirt. Now, this is inspiring. What a daring outfit, pulled off with panache! She should win a prize! I believe this woman is a veteran to this blog. Who is she??! anyway, i love that the overalls are a bit loose on her – it’s so charming. I never thought anyone could look this good in overalls… and those shoes!… a very youthful-looking ensemble. She looks so good on every point: smile, hair, clothes, shoes. the proper way to wear an overall-cuffed and heeled and well coiffed! I put on overalls and I look like a wannabe farmer, she wears them and she looks gtreat! Is there any justice in this thing we call: fashion? LOL! thank you for your work. ALWAYS inspiring. Now that’s style. The overalls NEED the vibrant colour of the shirt and the ladylike shoes. And the hair is adorable and completes the look. Well done. Keep taking those always so delicious photos! Carine t’aime. Ce n’est pas peu dire! Bien hâte de voir ton shoot dans le VHI. Oh, yes! Yes, yes, yes! What an ugly outfit.The overalls look so off date.She has the same haircut as A.W.Maybe it suits a younger face better. i cannot fathom how she did this. for one, she really should look much more farmer-y then she does. aside from it being one of my very favorite colors (orangy-red), that shirt is just.. i mean i picture it on a man, with chest hair, at a magic show, at a county fair. the zippers on those overalls indicate that she did not strip them from the nearest scarecrow, but in fact, paid a lot of money for them. and again, we’ve got that interesting silhouette of voluminous pants cinched at the hem. and.. the wretched bootie (yes, hers are quite cute, i get them sartorially). will i ever cave? maybe i’ll be a witch for halloween, and then inconspicuously integrate them into my winter wardrobe. but she is a peach, and her hair is spot on. it’s precise AND jagged. maybe she really is magic! any chance to get the brand of the shoes? Any qpecialist? I swear the sartorialist is pranking you. Every time I see something that I think is just so-so, or downright ludicrous, I expect to see at least *one* other comment that mirrors my own, but commenters on this page seem to blindly love whatever is posted. It would be nice to see some comments that at least play devil’s advocate to some of these ensembles… Are they being disapproved by the sartorialist and thus not published?? you simply have chosen the wrong image to make this comment on. Check the post with the gentleman in the Thom Browne whiter suit or the gentleman in the plaid shorts – I think you will see a very wide range of opinions. I agree that i would like to see more varying points of view but often these opinions are coupled with words like goofy, clown or worse. I’m all for fair discussion but I insist on a respect for the people who are being shot..NO ONE deserves to be publicly called goofy because of what they are wearing. She looks so happy in this too! To anonymous 8.54 am: Look at my comment-anonymous 12.41 am! I got through with my oposite opinion of the overalls! She is a winner, so very sweet! Not usually my thing, but I think she looks fantastic, she wears the look so easily and so well. And those shoes are gorgeous! this woman is my hero! 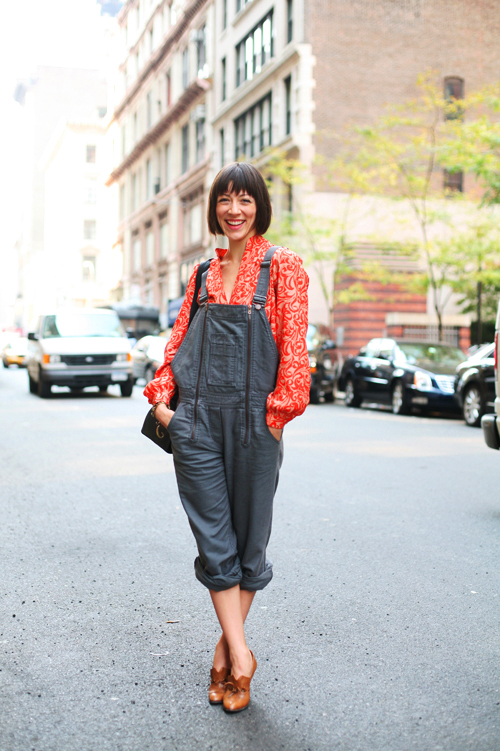 the failure rate for overalls is remarkably high…she pulls it off effortlessly. the feminine touches are perfect…the shoes, the blouse, the haircut…magnifico! Love the shoes. Want the shoes. The shirt comes a close second. I can only speak for myself, but when I am unmoved by or indifferent to something posted here I tend to move on. When I dislike a look, I also tend to move on unless I can say something constructive or make a thoughtful contribution to the discussion at hand. On those occasions when the photograph inspires or surprises or just makes me smile, I take great pleasure in saying so, and I suspect that this is often the case with others who comment here as well. this is realy fantasticl personal style. love it. Great shot! She looks so happy – you must keep these people laughing to get such happy faces. I think she is stunning. I love the shirt and the shoes, very feminine shapes and great colours to match what looks like a vibrant personality, and it contrasts so well with the baggy overalls. Daring and fun! i LOVE the shoes but i’m not wild about the blouse/overall combo. i like her smile though. she has the personality to pull this look off. She IS a veteran of this blog. Check out February of this year. She also writes the blog Fashion Weakley. ps. the blouse is actually a dress from Doucette Duvall. I’m sorry but I just hate overalls. The only people who should ever wear them those who regularly use paint. She would fit just right here in Texas wearing her overalls! You may be onto something there but it is more likely that the Satorialist is censoring the comments to his blog, and I suspect many unfavourable comments never see the ‘light of day’ published list. This may just be one way of protecting his profession, less negation of his work, more work comes in. wow you could not be more off base. Don’t you think it could be not about me and more about feeling a sense of respect for the people I shoot? They didn’t ask me to take their picture, I asked them. Because of that I will we need to be a little more respectful when we comment about them. These are real people and some have told me they have been a little hurt by comments left here. This blog is not a place to mock people, so if you cannot think of a way to state your opinion in a tactful manner then the opinion wouldn’t go up. I really cannot think of a situation where “makes her look goofy” could ever be respectful. sorry if it doesn’t work for you , but II will always try to maintain this standard. OMG! That shirt! That hair! That smile! She is lovely and a little quirky – perfect! Thank you for your explanation Mr. Sartorialist and I apologize, yes, I was way off base with my reasoning behind the censoring. I am now a wiser woman. I love her expression and those shoes are GORGEOUS! anyone know where I could find a pair or at least know a designer/brand that has them? I don’t think that she looks particulary “old”…!?! ?